In recent history, few athletic programs at Wake Forest have achieved as much success as the Men’s Tennis Team. This season, Wake Forest opened the 2018 spring season as the number-one ranked team in the nation, and they have done nothing but solidify their place at the top since play has begun. 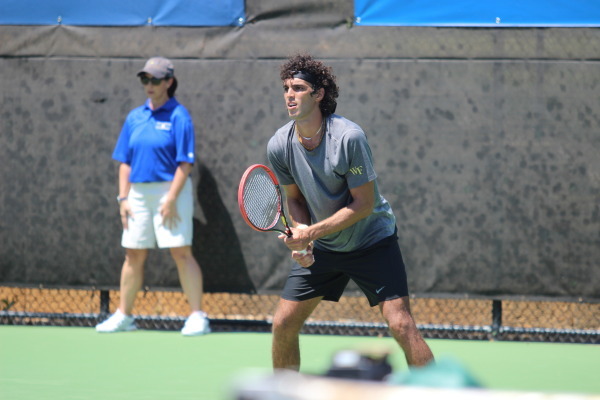 Players Petros Chrysochos and Skander Mansouri, each of whom made it to round 16 at the ITA All-American Championships in the fall, have helped pave the way for the team to continue its success in the new year. Wake Forest took on Elon and Coastal Carolina on Tuesday, Jan. 23, and handily defeated each team. The Deacons went 6-1 against Coastal Carolina and were able to sweep Elon with little challenge. Petros Chrysochos, who is ranked as the No. 4 player in the nation, is a junior from Cyprus. Chrysochos has accumulated an impressive amount of hardware during his career at Wake Forest, including an ITA All-American Championship title in the 2016-17 season. Although it is early in the season, Chrysochos and Bar Botzer both hold 4-0 records and hope to remain this strong as the season continues. On Friday, the Demon Deacons take on the Old Dominion Monarchs, Vanderbilt Commodores and Portland Pilots at the Wake Forest Tennis Complex on Jan. 26-27. Old Dominion junior Aziz Kijametovic was just named Conference Tennis Athlete of the Week by C-USA officials. In his past match against No. 23 Columbia and Penn last week, Kijametovic went 4-0 against both teams. He and his doubles partner Francois Musitelli are now 3-0 for the season. Coming off extremely successful first matches, the Demon Deacons will face some serious competition in the coming weeks. Not only do the Wake Forest Men’s Tennis team expect to achieve great success this season, but the Wake Forest Women’s Tennis team expects to make a great run this season, as well. This past Saturday, the Demon Deacons had two 7-0 sweeps in their opening double-header against two South Carolina teams, Furman and College of Charleston. Eliza Omirou and Anna Ulyashchenko, who are nationally ranked No. 42 in the NCAA will be a pair to watch this season. In their match against the College of Charleston Paladins, the pair won 6-3. On the singles side, Eliza Omirou is currently ranked 70th nationally, closely followed by Emma Davis at No. 72. Next Friday, the Deacons are playing in the ITA Kickoff Weekend in Columbus, Ohio that will last until Jan. 29.